It’s no debate that a stunning website and application deserve an equally striking admin panel and dashboard. A dynamic and powerful admin page that any web developer would love to work on will serve as a solid foundation that will help you create web apps, websites, and other web projects that are highly functional and extremely versatile. And this is especially true if you use the following Bootstrap admin templates that you can use for your web applications and website backend. Bootstrap is undoubtedly one of the best and largest web framework today as it contains a lot of robust features that are easy to use as well as flexible. Additionally, this popular platform makes these templates mobile-friendly and responsive, so you’re assured that your web projects are in tune with the latest web design trends. With a wide range of customization features and plugins to boost your app’s range of capabilities, these themes are carefully selected to provide you with the best web design tool that suits your needs perfectly. Let us begin with Infinite, a responsive admin template inspired by the iOS element and built on top of Booststrap 3.3.7 framework. Using the Bootstrap Grid System and customized CSS classes and with over 30 unique designs, 50+ solid and gradient colors which can be replaced with image backgrounds, and unlimited widget combinations, it has been carefully designed to give you the flexibility you need so your admin system matches your website needs. Second on this list is Complete Admin. 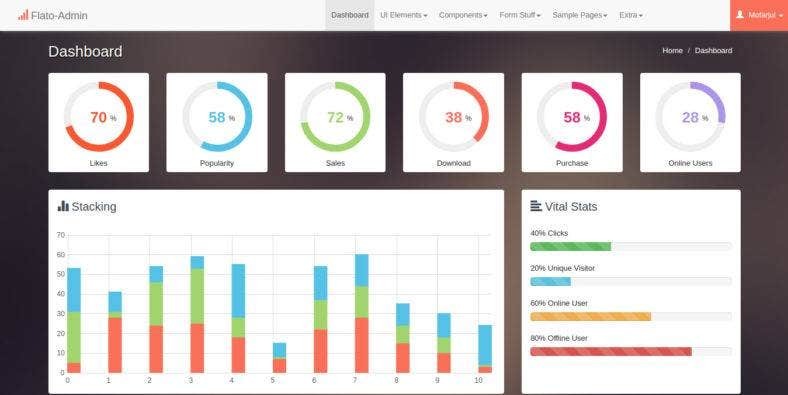 Based on its name, this is a premium template for admin user interface based on Bootstrap. It comes with more than a couple of versions namely, .NET MVC CORE (MVC 6), Angular, and the classic HTML/CSS3/jQuery version. 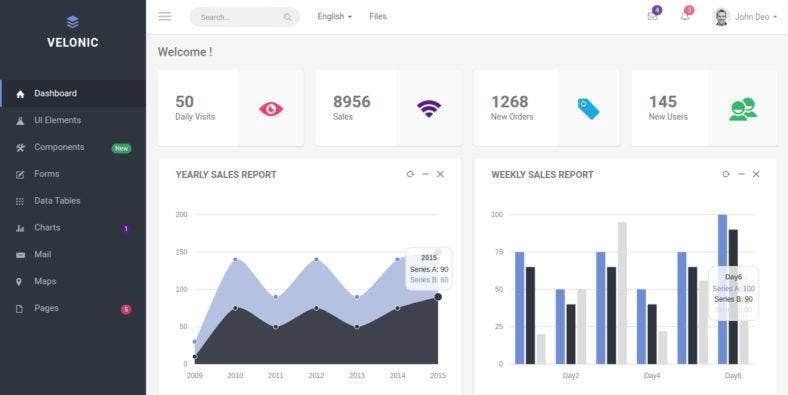 Along with a full page menu and a fixed menu with inner scroll, this template also features a huge set of plugins to make it an exhaustive admin panel that can cater to any web project. Next is Material Admin, another responsive admin theme inspired by Google Material Design and built based on the latest Bootstrap 3 and 4. The theme also comes with two different versions: jQuery AngularJs and Angular2, as well as two choices of skins: light and dark. If yo have been using Material Design, then using this theme is easy as it comes with completely customized plugins to match it. Lightweight but powerful, the theme is retina ready as well. 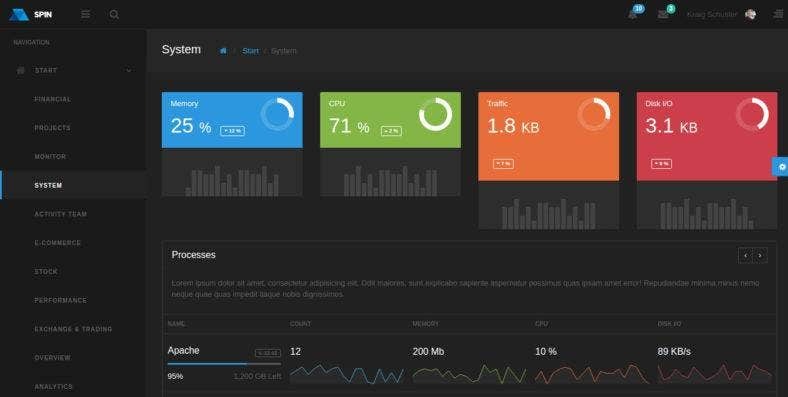 Spin is an amazing dark themed template made especially for your website’s admin panel and dashboards. Characterized by a clean and minimalist design, the theme enables you to build a stunning admin panel that you’d love to work on. 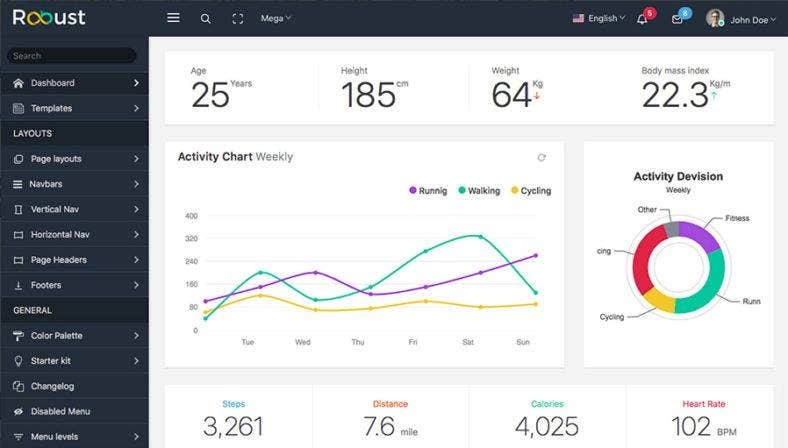 It includes five versions that you can choose from, along with 40 color combinations, more than 120 unique pages with 30+ applications, and over 20 layout variations to make your dashboard more personalized. An extremely simple yet flashy website theme, HyperMedia is created with lots of interesting design concepts to provide you a beautiful dashboard to manage your personal and business websites with. Built on the Bootstrap 4 platform, it features a native CSS Grid, SVG icons and charts, Inline SVG, Flex-box and Angular 2 animation among others. With a clean and minimal approach to its design, it doesn’t take a lot of effort to be able to use this template. 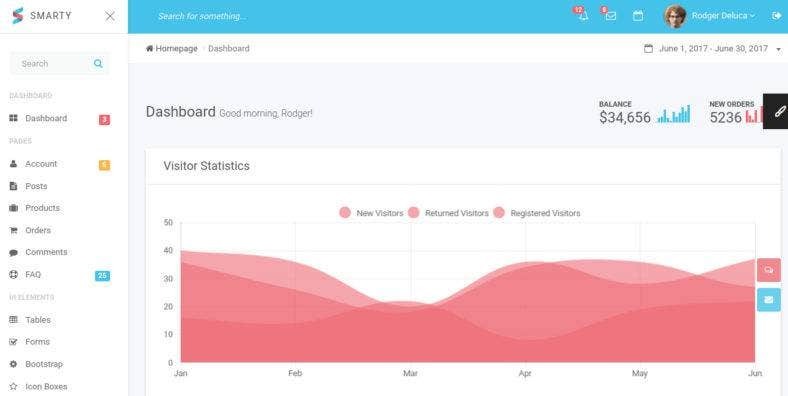 Circloid comes with a lively and energetic vibe through its use of various colors to present data and information on your admin page. Just like the previous templates, it is built with Bootstrap and inspired by Material Design. Even with all the colors integrated in the theme, it takes a minimalist approach to its design so the theme is easy to work with. It also saves you time as it comes with ready-made app pages and over 50 HTML pages. True to its name, Dynamic is a dynamic and responsive admin template that is powered by the amazing Twitter Bootstrap 3.3.1 framework. The theme is packed with updated features to let you start your web projects quickly. Among its many features are 3 column layouts to choose from, fixed and hidden headers and sidebars, integrated flow charts, Chartjs, and Morris chart, jQuesry sparklines, and many others. It also comes with a frontend template to match. 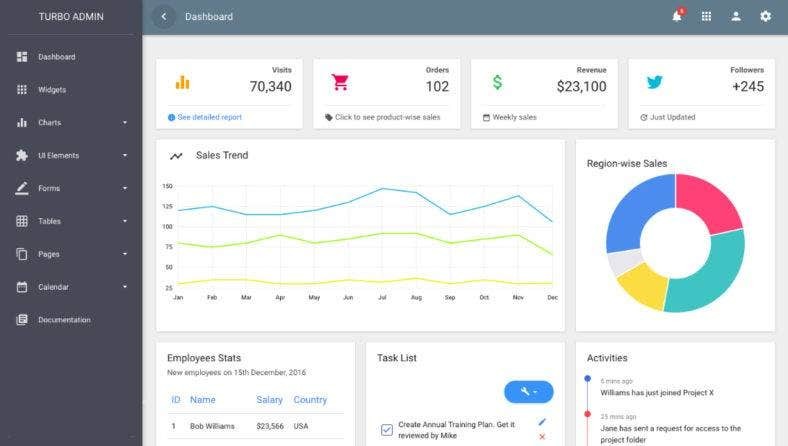 Considered to be the ultimate dashboard template, Ample Admin has a clean and clutter-free design which is integrated into both demo versions, minimal admin version and Material Design dashboard version. A responsive HTML template based on the CSS and Bootstrap 3.3.7 frameworks, it ultilizes all of its components and customizes many backend applications to let you create a highly functional and extremely flexible admin and dashboard page. 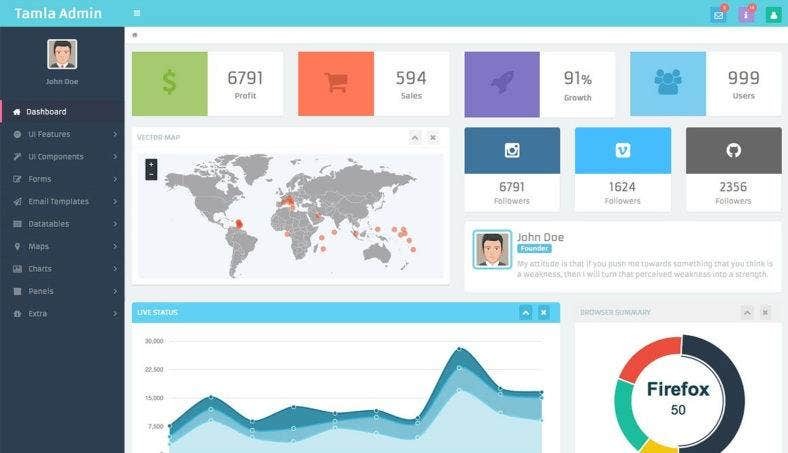 Velonic is an admin dashboard and frontend theme that is fully incorporated with premium features and options. Built on top of Boostrap 3.3.6 along with modern web technologies HTML5, CSS3, and jQuery, this theme has lots of ready-to-use components that allows you to create an admin page quickly and easily. Fully responsive and extremely customizable, this theme gives you the power to turn the template into a working web application. Definitely a nifty piece to consider, Nifty offers a neat and stylish template with excellent functionalities. This responsive admin theme is built with Less CSS and based on the latest Bootstrap 3.3.7 framework. Packed with powerful features such as its smart navigation options which collapse or expand the navigation panel, its off-canvas capability, 36 color schemes, over 2000 high quality premium icons, 9 transition effects, and 7 exclusive plugins. 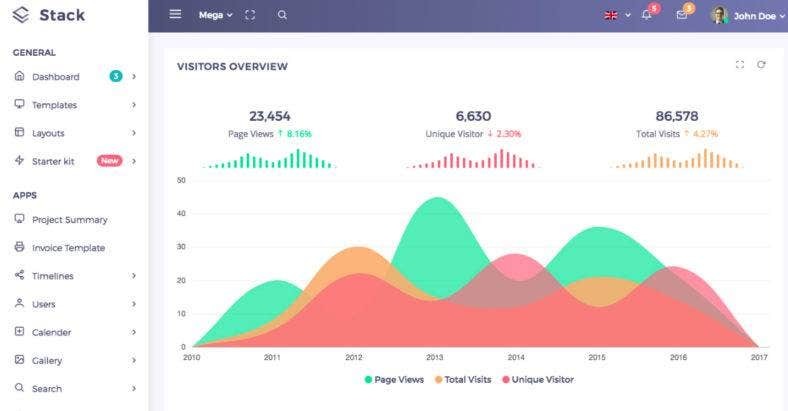 A multipurpose admin and dashboard theme, Magilla provides a bold and colorful data presentation over a dark and elegant background. 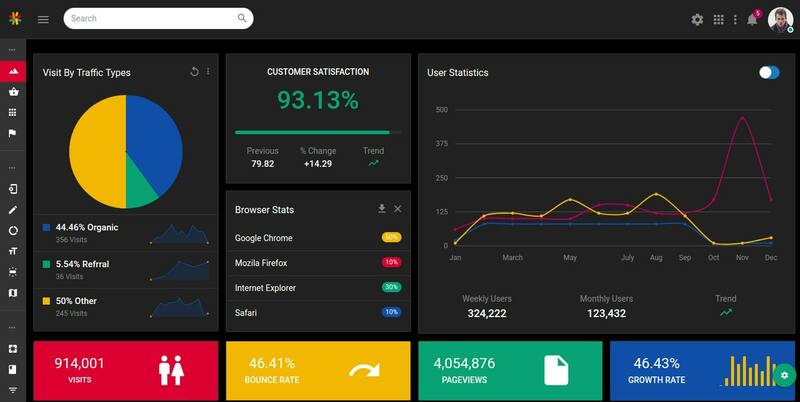 This ultimate template comes with 5 admin dashboards and 4 demos to choose from so it matches the website you’re running. Other features include an RTL support, special mobile menu, live social feeds, working apps, light and dark skins, full-width or boxed layouts, and various color options. 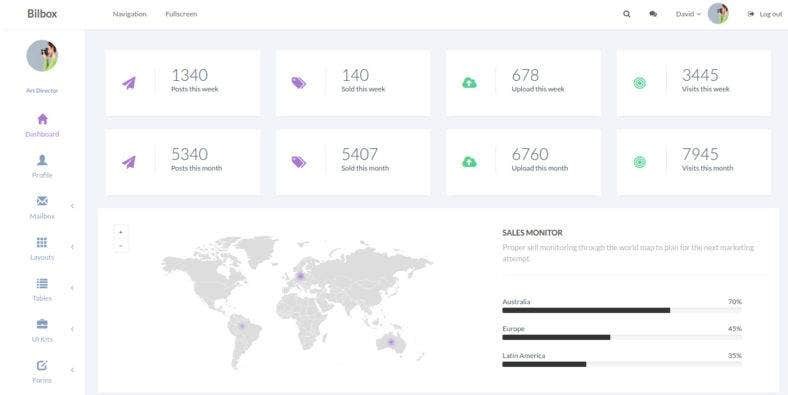 Smarty is certainly a bright admin dashboard template with its pastel color palette on a stark white canvas. The theme comes with different admin dashboard pages to quickly start building your web applications, along with pre-defined color schemes and cool animations. Built with Twitter Booststrap CSS framework and 1170 Grid System, it is completely modular and features a super flexible UI to develop your frontend and backend pages. The Bootstrap 3 based template you see above is a flat responsive theme with a bunch of trendy features as well as an awesome frontend, a collection of new pages, and an improved code. Archon boasts of its premium extended attributes such as unique widgets for many purposes, data table with sorting and filtering capabilities, a login page with a fullscreen background, and a large set of useful jQuery plugins which match modern standards and topnotch deisgns. Another Material Design based admin theme is Turbo. The template is characterized by a clean, simple and elegant aesthetic integrated into all of its awesome dashboard choices. A Material Design UI kit, it features over a hundred of UI components and pages that are easy to use and highly customizable. 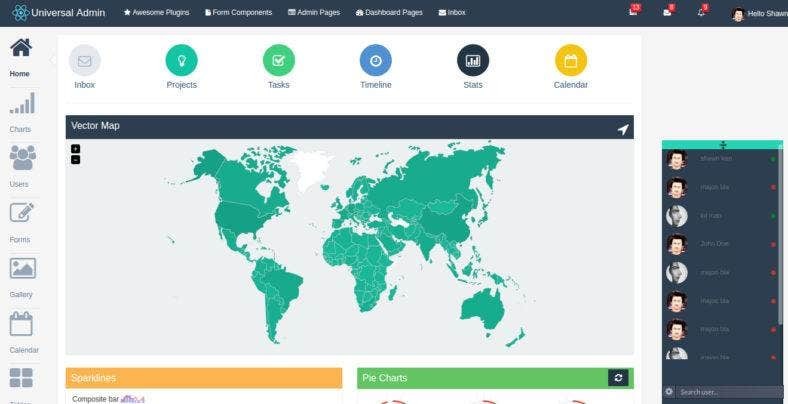 This template can be used to create all types of web applications such as a custom admin panel or dashboard, web application backends, and admin CMS, CRM or SAAS. 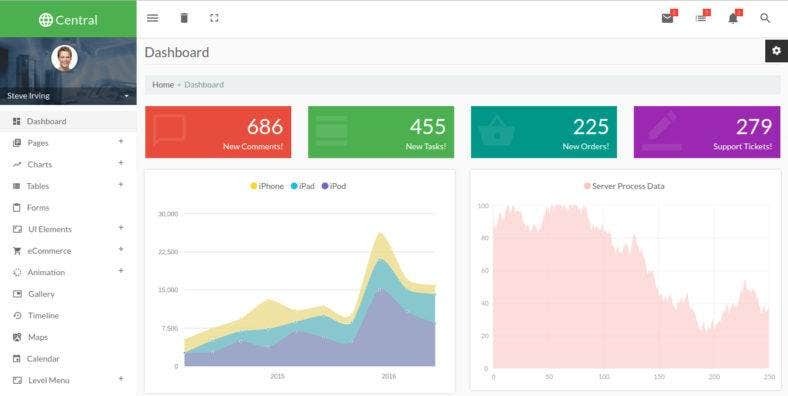 This responsive Bootstrap 4 admin template has a gradient UI style and comes with a JADE template builder which users love. Stack is one of the best-selling admin theme as it offers a well-documented and logically designed tool that helps create a scalable customization process to the theme. It includes 7 pre-built templates with an organized folder structure along with 1500+ pages, 500+ components, 100+ charts, 50+ advance cards, and much more. Atlant is a responsive Bootstrap admin theme that provides an extensive collection of custom layouts and ready-to-use features. It is a powerful template based on Bootstrap 3.3.5 that is fully responsive and retina ready, so it is compatible with all devices. The Atlant page builder allows you to create new pages instantly as it comes with 10 different skins to suit your taste. Using the latest web building technology, this theme will surely help your business to grow. Designed specifically for admin pages, Wintermin is a Bootstrap theme built on the latest verison of Twitter Bootstrap 3 which is loaded with new features and customization options. The theme comes with multipurpose admin functionalities that provide a perfect solution to any web development project. It also features autosavable portlets, awesome charts to present information in a simple manner, a set of ultility classes to create widgets, and more. 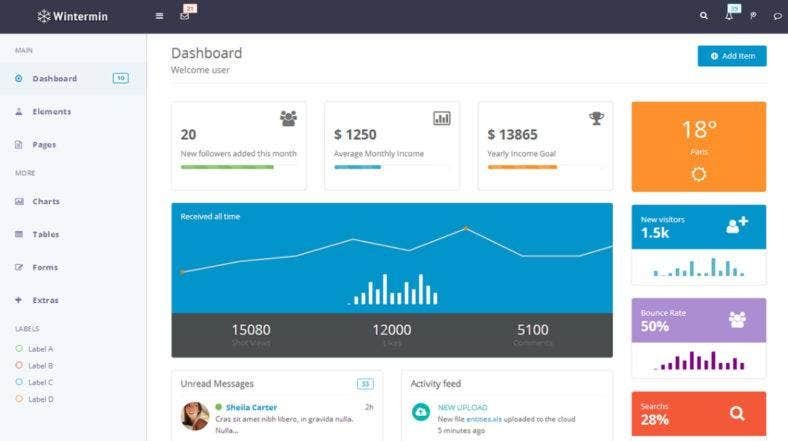 A responsive Bootstrap template, Universal Admin has a flat design with a professional and flexible skin solution to fit all kinds of web developments projects such as web applications, custom CMS backend, social network backend, and other backend website solutions. Simple and intuitive, this admin theme is guaranteed to be packed with awesome features and great functionality that will surely boost your website or web application’s performance. This list offers you a collection of exclusive and high-quality admin templates that you can use for both web apps and website backend. Either way, it is guaranteed that these templates will help you build a successful web presence, whether you’re developing a personal, corporate or business website or application. 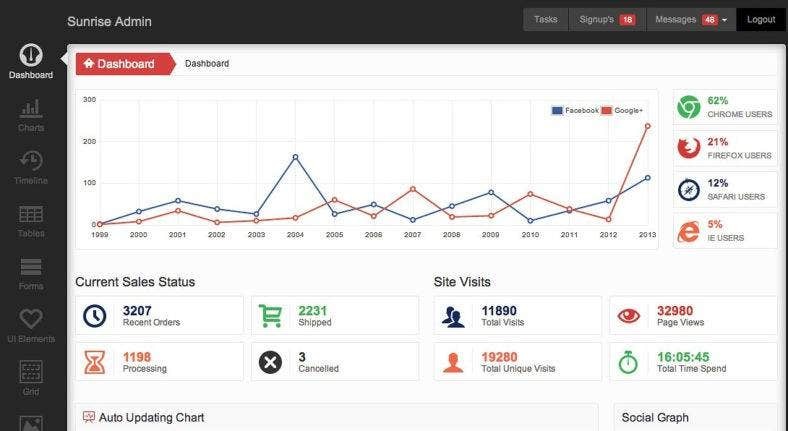 For more examples and ideas, you can check out our previous collection of the best Bootstrap admin themes and templates.